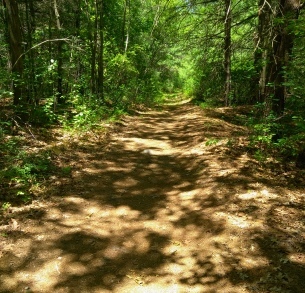 The Thompson Pond Trail is the second of the two hiking trails located on the Abington/ Rockland town line on Spruce St. This trail along with the Twin Ponds Trail were both developed by the Wildlands Trust. 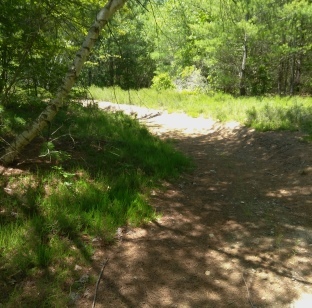 Using existing cart paths and newly formed ones to create a trail with a loop that runs along Thompson Pond. 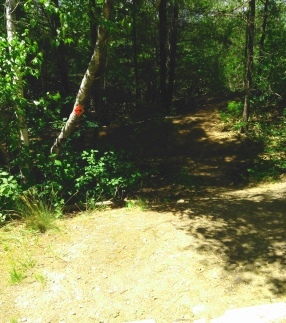 The parking area for both trails is located on Spruce St. 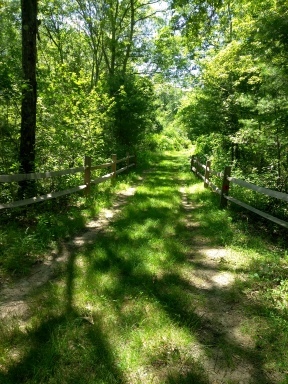 Both properties are lined by an attractive split rail fence. Once parked follow the trail past the kiosk. Only a few steps in and you will find yourself at the edge of an enormous field. 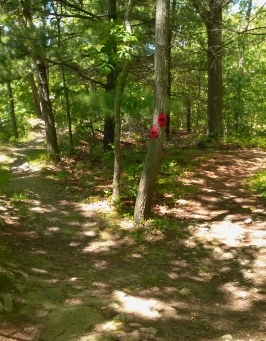 Here you will find arrows pointing to the Thompson Pond Trail to the left and the Twin Pond Trail to the right. 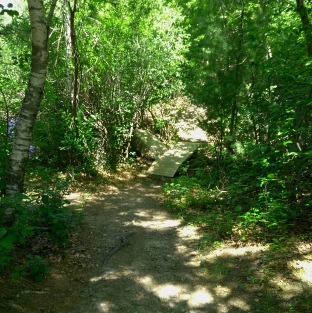 Both areas contain hiking trails that were already in existence but the Thompson Pond Trail seems to have many more smaller trails following away for extra exploration. 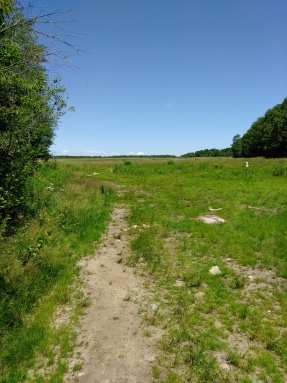 Following to the left for the Thompson Pond Trail, you will notice a well defined dirt road with a grass mown trail even further to the left. Either can be taken, but in spring, summer and early fall there will most likely be tall grasses that separate the two. 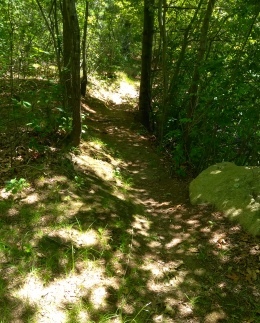 Following the hiking trail to the far left, the trail follows close to the edge of the forest providing bit more possible shade along the way. My journey was in early summer. Lots of insects, but the large field provided plenty of breeze to keep them from landing. Any hiking in summer should include lots of repellent and a hat is usually a good addition for protection from insects. At 1/4 mile there will be a marker and a home made style bench at the side of the forest. Afterward the trail curves slightly to the right. At .38 you will find the trail takes a deep left and enters the forest through a chained set of posts. 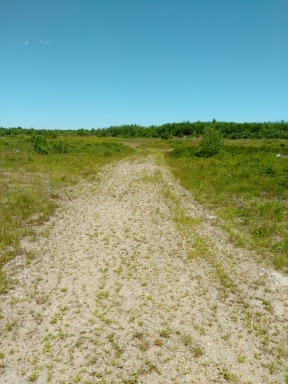 The dirt road has a connecting portion here as well. 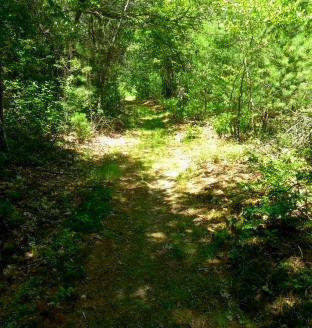 The trail leading into the forest is a wide grass filled road. The hiking trail leads downhill here at a moderate grade. later in Rockland Town Forest. 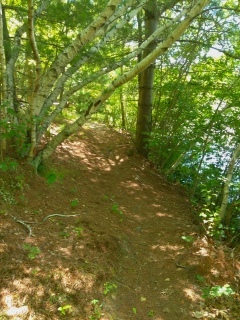 The trail then runs uphill again and at .57 reaches the pond area. 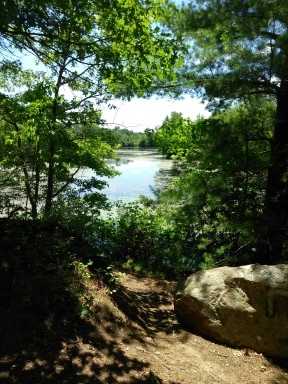 trails that will take you to view points on the pond. Additionally if you look to the left you will find a chain link fence and a narrow trail running to the inside of it. the trail runs steeply downhill. pond over a small footbridge. even more steeply up to a chain link fence. Here the trail runs narrowly on a rocky track. Soon there will be an intersection with arrows pointing both ways. This is just a smaller loop with the same destination. To the left the trail runs close to the water. To the right it runs further into the forest. Both connect again at about .70 and shortly after enter a large open sandy area. An arrow points to the right. The trail here is a narrow sandy track that makes a sweeping curve to the left. Along the way is another narrow trail leading off to the right. The trail re-enters the large field??? Almost pointless, but still interesting, where you will find another arrow once again pointing to the right. This time it follows straight into the forest. At .86 the hiking trail comes to the intersection of a trail loop. Either way can be taken but I followed to the left. The narrow path turns to a hard packed cart path with occasional rock, grass and moss litter. Soon the hiking trail will lead gently downhill and at .93 turns slightly to the right. 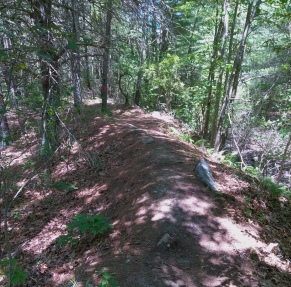 An older trail heads straight, lightly blocked as many of the trails in this area are. There will be a short uphill jog with the way blocked once again. The arrows point to the trail taking a sharp right on a narrow trail along a bit of a ridge. At one mile this narrow trail will once again join a cart path, blocked to the left with an arrow urging you to the right. 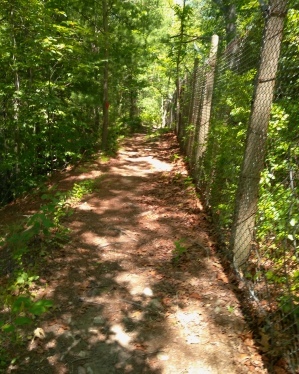 This portion of the trail is running alongside route 58 on the inner side of the commuter rail. As I head down this trail, the train passes by. At 1.06 the cart path makes a right. 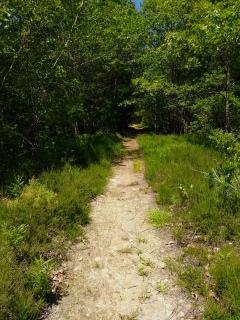 An older overgrown portion of this trail continues straight. The hiking trail now becomes rocky and gravel based lending itself occasionally to plots of grass. 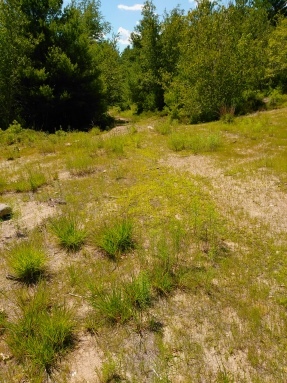 A ridge of taller grass runs to the left of the trail and soon that side of the trail has the appearance of an overgrown nursery. 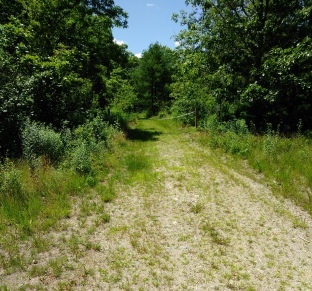 The trail curves to the right and on this curve to the left another overgrown older cart part can be seen. Shortly after the curve another overgrown and lightly blocked cart path appears to the left. Unfortunately this area in past times was used as a dumping spot. At 1.29 we arrive back at the loop intersection. I now notice that one of the narrow trails I spotted on the way to this point joins this trail to the left. At 1.35 we arrive back at the sandy field. If you have not already done so, there is much to explore here. 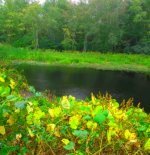 Several older cart paths and smaller paths lead to observation spots on the pond. across this field, back into the forest the way I came. At 1.40 I take the loop section along the water not previously taken. At 1.44 there is a bench by the water. Just before this there is a small path that takes you down to the water. Just after the bench you are back at the portion of the trail that runs along the chain link fence. Back over the little footbridge and left onto the cart path out. From this angle I now notice how this area has a once upon a time farm look to it. Grape vines line the trail and over the culvert once again. Now at 1.61 the hiking trail starts to climb on its grassy road. Once out to the gate with the chain, I continue out to the dirt road along the large field as an alternate way. Many a bicyclist is riding that road on this early summer day. The rest of this dirt road heading to the left appears to possibly meet the road through Union Point. An explore for another day!!! Going right at 1.84 on this road. Finding many wildflowers in bloom and birds in the field. From exit 14 follow Hingham St towards Rockland. Take a right on Reservoir Park Rd, at the Comfort Inn. Follow to the next set of lights and take a left onto Weymouth St which becomes VFW Parkway. Follow this to the end and go left on Union St. Take the next right onto Salem St. Follow this to the bend in the road and follow straight for Spruce St. 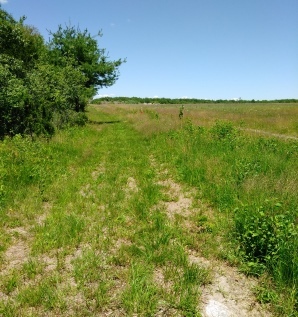 Soon you will find the split rail fence lining the street and you can select either the formal parking area or the spot across from the trail head. Moderate to extensive depending on exploration of other trails. Mostly Easy: one steep incline by the pond. Thompson Pond and seasonally the stream flowing out of it.